Happy Halloween! To celebrate, here's Oingo Boingo performing Dead Man's Party in the legendary film, Back to School. This is the perfect video for Halloween, right? Listed below are 10 songs and year of the songs' release from Paste magazine's 2013 list of "the 50 Sexiest Songs of All Time." Yes, this is the first time I have ever heard of Paste magazine. I know "Cut and Paste" magazine, but not Paste. Anyway, your challenge is to name the artists. As always please leave your answers in the comments section below and do not use the internet for assistance. Good luck! This quiz is courtesy of the fine folks at Stump Trivia. Sunday's Pittsburgh Steelers-Indianapolis Colts game was really frustrating. You're probably thinking, Sean, you're a Steelers fan, what the heck are you smoking? The Steelers scored 51 points and defeated one of the best teams in the NFL rather handily. Sure, the defense gave up 34 points, but the Steelers constantly pressured and hit Andrew Luck, had two interceptions and overall, seemed to play well (outside of Cortez Allen). Plus, the offensive line allowed zero sacks despite Ben Roethlisberger attempting 49 passes and Le'Veon Bell rushed for more than 90 yards. So why frustrating? Well, how can a team that lost at home to a now 1-6 Tampa Bay Buccaneers team, got crushed 31-10 at Cleveland and barely defeated a now 1-7 Jacksonville Jaguars team play so well? While we didn't expect the Steelers to play this well for the entire season, we certainly felt like they could particularly with so much talent on offense and more speed on defense. Frustrating. 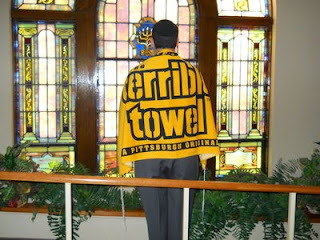 Putting this out there now...who thinks the Steelers are going to win today? I received exactly zero replies. Sure, it's possible (okay, likely) that no one reads my tweets, but I think the mindset of most Steelers fans was that they would lose. 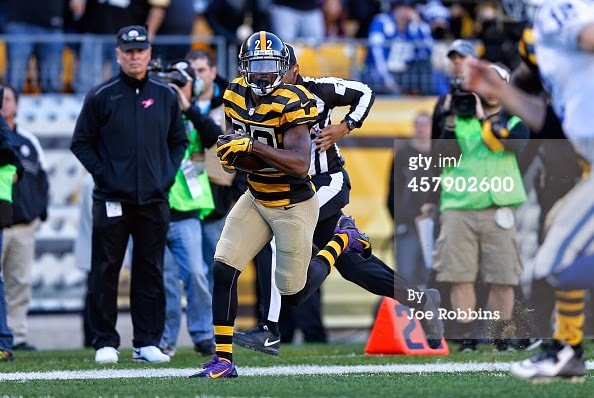 - So why didn't Steelers rookie WR Martavis Bryant play during the first six games? He looks like a legitimate NFL receiver. As I wrote back in May, he is the most successful Martavis in Steelers history! - This Pick-6 was Gay. - Andrew Luck is really hard to get down. It seemed like there were at least 5 times when a Steelers defensive player was in the process of tackling the Colts QB, but Luck was still able to throw the ball away or amazingly to a receiver. - In the previous four games, the Colts defense gave up four 3rd down conversions. The Steelers were 8 for 13 in 3rd down efficiency on Sunday. - Is there anyone who doesn't think Antonio Brown is one of the best wide receivers in the NFL? He currently leads the league in catches, is second in receiving yards and is tied for 4th (and alone in 2nd among wide receivers) in receiving touchdowns. While Benstonium went with the YMCA comparison, I prefer Men Without Hats. Steelers-Ravens next week. Man, the AFC North is tough this year. In the mid-1980s, Lisa Lisa and Cult Jam with Full Force had a string of hits. One such song was All Cried Out. I have no idea why, but I really like this song. Perhaps it was the back and forth vocals between Lisa Lisa and the male singer, who I always thought was Cult Jam. According to Wikipedia, Cult Jam was the band name and not the guy. Lisa Lisa (born Lisa Velez, January 15, 1966) and her band Cult Jam are an urban contemporary band and one of first freestyle music groups to emerge from New York City in the 1980s. Cult Jam consisted of guitarist/bassist Alex "Spanador" Moseley, and drummer and keyboardist Mike Hughes. They were assembled and produced by Full Force. So I guess we're left with an extra from Karate Kid singing that he's so sorry only for Lisa Lisa to reply apology not accepted. You may remember back in April that I wrote about my second child arriving into this world. (This sentence makes it sound like Superman coming to Earth from Krypton. I'm okay with this!) Of course, you may not remember this since I've barely mentioned him on the blog. Now that "Pedro Tulowitzki" is 6 months old, let's take a look back on the past half year. For the first month or two, I was convinced that my son hated me. Much of this was because I was not his mother and could only provide so much assistance and support. Apparently, he didn't value my ability to change diapers or rock him to sleep. Ever since he could smile, things changed. I just love making him smile and laugh, and I have been rather successful in accomplishing this (well, at least the smiling part). As much as I think that Pedro Tulo loves me, I'm no match for his older brother. Pedro Tulo LOVES his brother and thinks he is the greatest thing since sliced bread. Actually, he doesn't know anything about sliced bread, so the greatest thing since his own hands which he enjoys putting in his mouth. I know I shouldn't do this, but occasionally, I'll let Pedro Tulo sleep on me. He should probably nap in his crib, but it's a nice feeling. 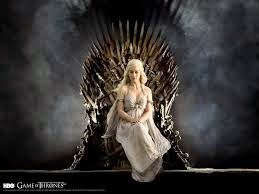 In the early months, I often gave Pedro Tulo the "last" bottle before bed and watched Game of Thrones during this time. I clearly deserve Father of the Year for letting my infant watch Game of Thrones. I'm really looking forward to the days of sleeping in past 6:00. Yes, Pedro Tulo still does not sleep through the night. On a related topic, sleeping like a baby is a stupid statement unless the individual means that he/she woke up once or twice during the night and didn't sleep well. Pedro Tulo now has 5 first cousins (plus his brother) all under 3 & 1/2. He's going to have a lot of fun with them as he gets older. I sense some mischief in the future. In 6 months, he has had 2 or 3 ear infections. I write 2 or 3 since the last one was either a 3rd ear infection or the 2nd one never fully went away despite the antibiotic. Pedro Tulo - If you're reading this in the future (or even now), you have no idea why I'm referring to you as PT, but don't worry about that. You certainly let us know when you need something and are quite loud in letting us know this. However, when you are happy, you are truly very happy and have an infectious smile. You are loved so much. Now please sleep until 6:30 or 7:00 this weekend! While much of the sports world is praising Peyton Manning today for breaking the NFL record for most career touchdown passes and for leading the Denver Broncos in an impressive win over the San Francisco 49ers, I find it necessary to bring up something no one wants to discuss. Why is Manning wearing a jersey tucked into jeans? Is this how Peyton Manning dresses or was this the idea of someone at Papa John's? I also question wearing a black belt with an orange jersey and jeans. A brown belt may be more appropriate, though it might depend on the type of shoes he is wearing. A tucked in football jersey, jeans and black shoes doesn't seem like a good outfit. This has been another edition of Sean on Fashion! You can also "Like" Sean's Ramblings on Facebook. Update: The video above doesn't seem to work anymore, so here's another Papa John's commercial showing Manning with his jersey tucked in. Now the second one was definitely(?) from my older son. It's possible that the first one was also from one of my kids, but the spacing and the use of capital and lower-case letters makes this seem unlikely. So should I be worried that someone hacked into my wife's cell phone? Picture it. Pittsburgh. 1992. I was a star player on my high school soccer team. On a late October evening, we had a rare match under the lights instead of the usual afternoon start time. With the temperatures dropping into the low 40s, either my school wanted us to look more like a team traveling to an away game or they actually worried about us freezing in our thin long-sleeve jerseys and shorts (or both). Therefore, they issued us sweatpants and sweatshirts from the track team. As a substitute, I wore these clothes on the bench for the entire game. Although we were supposed to return these cloths, I kept the sweatpants and still have them today. 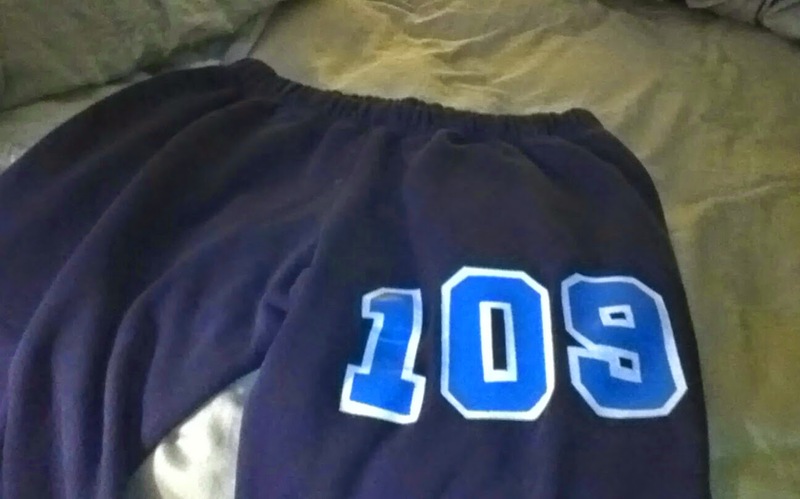 Despite weighing about 125 pounds in high school, I received this pair of XL sweatpants. There was a drawstring inside that allowed me to tighten the waist, and they were slightly long. I took the sweatpants to college, with me when I moved to San Diego, to Columbus for grad school, and they stayed with me during each move in Northern Virginia. The drawstring is now long gone and there is a hole on the right leg, but they have always been dependable. Of course, I primarily wear pajama pants in the house during winter now, so I rarely if ever wear sweatpants. In addition, while the days of being 125 pounds are long gone, I've lost about 35 pounds from my all time high about 10 years ago, so the pants truly don't fit anymore. I basically keep them up through will power. So after 22 years, it's time to say goodbye to these sweatpants. It's time to retire the old 109er. Thank you for making me feel like a superstar athlete and for keeping me warm. This could be the first in a series tentatively titled "Goodbye Old Clothes." Once my infant clears the "spit-up" stage, I have a lot of T-shirts to go through. 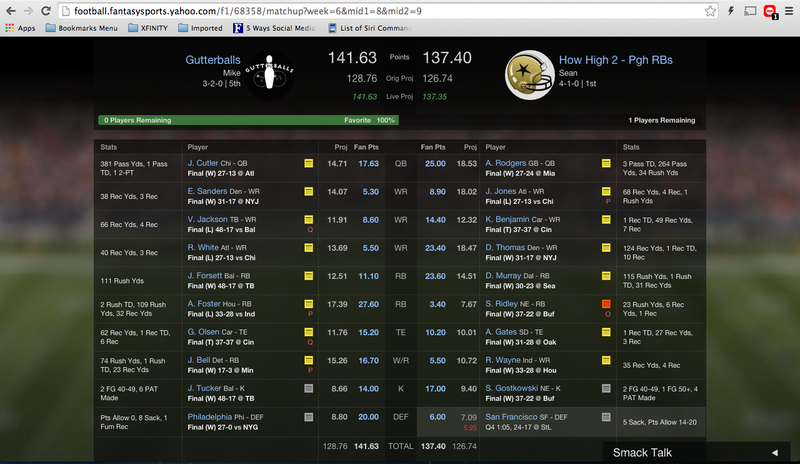 I know that you don't care about my fantasy football teams, but I wanted to share this anyway. 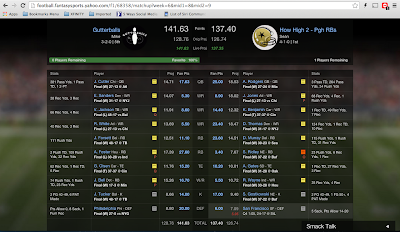 Going into Monday night's San Francisco-St. Louis game, I needed a good night from the 49ers defense to win. When I fell asleep on the couch sometime during the 3rd quarter, things didn't look very good. 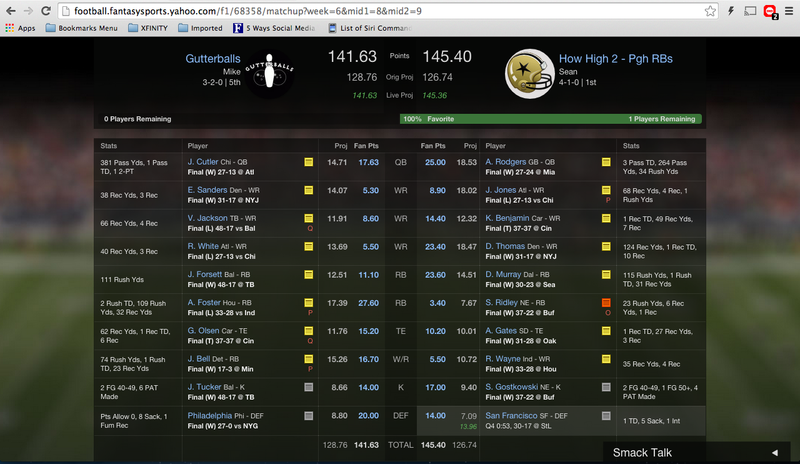 With about 1 minute remaining in the game, Yahoo declared my opponent a 100% favorite. Then, Dontae Johnson of the 49ers intercepted a pass, returned it for a touchdown, and made Yahoo change its mind. While I'm very happy with the result, I would have been ecstatic if I was awake and watching this live. 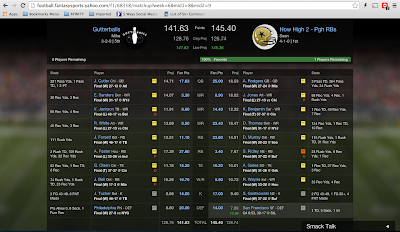 Meanwhile, in the Pittsburgh Bloggers Fantasy Football League, I had a chance to avenge my championship tie defeat from last season in the craziest ending in fantasy football history. The result, another freakin' tie! In my five leagues (that's less than last year! ), I'm now 5-1, 4-2, 3-3, 2-3-1 & 0-6. I don't want to talk about that last league. Urinating In The Shower For The Environment? Students at the University of East Anglia are encouraging their fellow students to skip their first trip to the toilet in the morning and to, instead, urinate in the shower, the BBC reported. The idea is to save water by avoiding the first flush of the day, and student materials (see below) suggest significant water savings could be achieved. Students are being encouraged to pledge their participation with the #gowiththeflow hashtag on Twitter. Get these students a Nobel Prize! Unfortunately, not everyone is on board with this idea. The comments section, likely consisting of academic elite or at the very least better educated folks than your typical message board crowd, is incredible. Skip the California politics stuff and you get some wonderful opinions about urinating outside and washing yourself in the toilet to help the environment. Personally, I think we need further study about this. Thoughts? Yom Kippur ended nearly a week ago and Rosh Hashanah is now two weeks behind us. So, of course, I'm writing about the High Holy Days/High Holidays today. I'm all about timing. Anyway, Rosh Hashanah and Yom Kippur are days of reflection, prayer, celebration (in the case of Rosh Hashanah) and atonement (in the case of Yom Kippur). Going to synagogue for these holidays/holy days is a bit more challenging with two children. Fortunately, the synagogue we attended included many families and services specifically geared towards kids. Unfortunately, if you (and by you I mean me) wanted some individual time for prayer, that wasn't going to happen. This isn't going to be a religious post, so please don't leave just because of the topic. It's more about the experience going to synagogue for the high holidays with kids rather than, well, something else. It didn't take long until we exited the sanctuary to find the preschool service. The preschool service was outstanding with an energetic and patient teacher, and after a successful trip to the potty (for my 3 year-old, not me), we went back to the grown-up service. We entered during the Torah service and saw them carry the Torah around the room. Unfortunately, I quickly realized we came in during the end of the Torah service. We arrived just in time for...the Rabbi's sermon! While my kids might be fascinated by some prayers/songs, they weren't going go get anything out of the likely 15-minute sermon. It was more likely that they would distract others. We quickly left. During the morning Yom Kippur service, we went straight to the kids' service. After that ended and with both kids occupied, I wanted to go into the main service for a few minutes. The room was packed, so I managed to squeeze into the middle of a row. About 2 minutes after I entered, the Rabbi called up two members of the congregation...to present the annual appeal asking the congregation to give money to the synagogue! I was stuck. There was no way I could discretely sneak out, so I stayed and listened and hoped it would end quickly. When it did, I pushed (not literally) my way out. I guess the morale of this story is that I'm not ready to take my kids to the main Rosh Hashanah and Yom Kippur services. Maybe next year? One of my favorite events, the 22nd annual Fall for Fairfax, takes place this weekend at the Fairfax County Government Center. If you have young children (like me) through elementary school-aged kids, this is the event for you. First, it's free. Yes, there are some activities that cost money (ex. carnival rides, scarecrow making and pumpkin painting), but most of the event including kid-friendly entertainment on three stages is free. Personally, I'm excited to see my oldest son with the animals at the petting zoo and getting to climb on and see the fire and rescue vehicles. Several years ago, the festival made the decision to extend this event from Saturday to an all-weekend event. With Yom Kippur on Saturday this year, the organizers made an excellent call. Otherwise, we would have had to miss Fall for Fairfax this year. For more information about Fall for Fairfax, click here to visit the festival website. In addition, feel free to go up to any of the festival staff and volunteers and tell them that you learned about the event through Sean's Ramblings! Don't forget to like Sean's Ramblings on Facebook! This might be the first baseball live blog ever on Sean's Ramblings. Join us, and make sure that you are wearing black. As a soccer referee (and probably every other type of referee), you are required to dress professionally. There is no room for individuality when you put on your yellow shirt and pull up your black socks with white stripes by your knees. Therefore, I was a little surprised when I received the October e-mail from the U.S. Soccer Federation ("USSF") Referee program including a link to Official Sports' Breast Cancer Awareness apparel page. 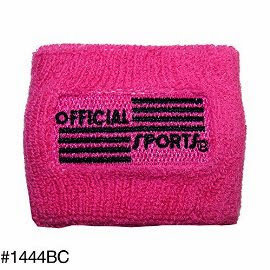 The company is selling various products like wristbands and whistles so that referees can show support of Breast Cancer Awareness month with proceeds to be donated to Stand Up To Cancer. While I applaud Official Sports for their efforts, I'm a little skeptical about how much will go to Stand Up To Cancer. For example, the wristbands below cost $3.95. Does the entire $3.95 get donated to Stand Up To Cancer or is it a certain percentage? I contacted Official Sports about this and will post the company's reply if I receive one. I just hope this isn't a case of Official Sports promoting more merchandise! 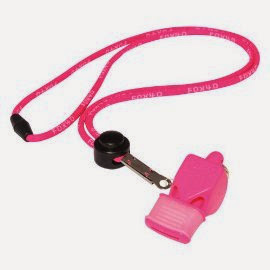 Please note that I think USSF wouldn't be pleased if referees used a pink whistle or wore pink wristbands once Breast Cancer Awareness month ends. That wouldn't look professional. Thank you for your email and inquiry. Official Sports donates 40% of the retail price to Stand Up 2 Cancer. Is that an appropriate percentage?